Your 4 Count Cupcake Insert Has a Bright Side, and Natural Brown Side. 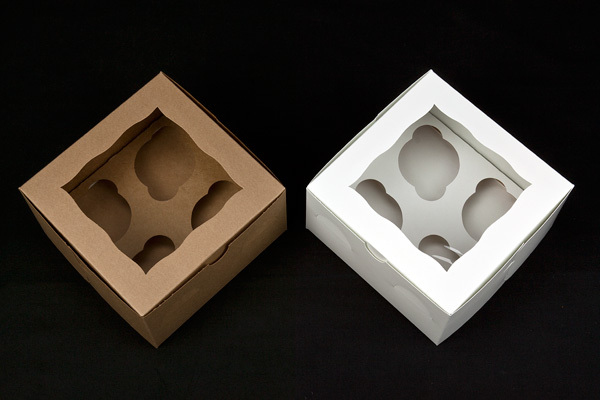 The 7" x 7" x 4" cupcake boxes below (sold separately) use the same cupcake insert, just inside-out. The cupcake holder inserts that you see fitting snug in the cupcake boxes above (sold separately), are the exact same item (item 1762). 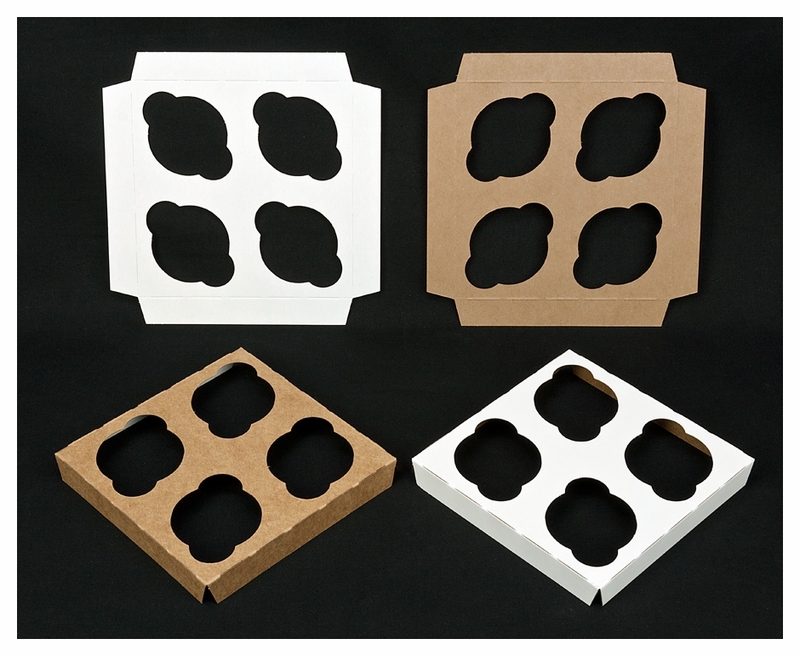 These Inserts have been custom created to cradle four of your favorite cupcakes inside one of our many 4 count cupcake boxes. Our Natural Brown cupcake boxes are getting discovered by bakers every day! As you can see, the cupcake Inserts we've designed to work inside these boxes look great in whatever cupcake box color you choose. 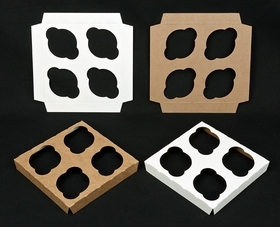 It is no problem to simply fold the legs on our half dozen cupcake holder insert so it is facing natural-brown-side-up. When transporting your cupcakes inside their cupcake boxes, make sure you hold the box by the edges and not the bottom. A hand pressing up the middle underneath your cupcake box will launch your cupcakes out of their cupcake insert and headlong into disaster. Make sure when you move your cupcake box you 1.) bend at the knees and 2.) hold your cupcake transport and presentation system by the corners. I'm glad that I finally ordered these. I love the look of the window boxes for my cupcakes! These are pretty standard cupcake inserts. They fit the boxes I purchased perfectly and basically perform their job. They work well with my boxes and always get them in the time that I need them. Reasonable priced. Hi Lukas! The diameter of this insert is 2 1/2" and the depth is 7/8".